President Barack Hussein Obama, a pathetic creature who is trying to arrange for Iran to develop their own nuclear weapons and who actively sought the defeat of our closest ally in the Middle East, has a tremendous amount of egg on his face. Despite Obama sending his minions to Israel to undermine Netanyahu by pumping up the Arab vote via Saul Alinsky-community organizing tactics, Patriots of state of Israel beat back the Leftist Obama-Arab hoards at the ballot box. 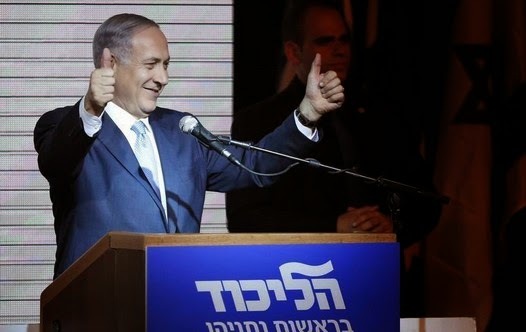 “Hail, hail, Bibi,” Likud adherents chanted as Netanyahu took to the podium on Wednesday. “We have scored a major victory for the nationalist camp headed by Likud,” Netanyahu said. “I’m proud of the Israeli people because at the moment of truth they knew to differentiate between challenge and nonsense and they took up the challenge,” the prime minister said. After the prime minister raised eyebrows in the latter stages of the campaign by warning of a high voter turnout among Israel’s Arabs, Netanyahu seemed to be extending an olive branch to Israel’s minorities during his speech. This is for you, Bibi!